The occupants of a building want peace and quiet. Here’s how to engineer the subfloors and cold-formed steel flooring joists to meet that demand. The occupants of a building want peace and quiet. 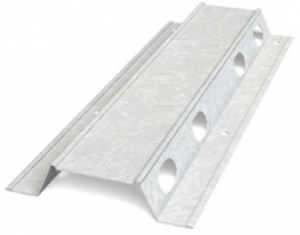 How can you engineer subfloors and cold-formed steel (CFS) flooring joists to meet that demand? The answer involves designing CFS floors with greater mass. You must also take into account joist spacing, resilient channels, vibration breaks, and a few other factors. But first, you must understand the basics of sound transmission. Airborne sound travels through the air. It can pass through walls and floors and reemerge in surrounding spaces, as shown in the adjacent diagram. Impact sound (or structural-born sound) involves the mechanical excitation of partitions, even though some of this sound is eventually conducted by the air. Impact sound can originate as footsteps, a treadmill, or furniture dragged across the floor, as just a few examples. Direct sound transmission travels through separating partitions. 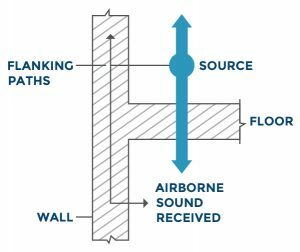 Flanking sound transmission travels through other pathways, such as common floors or ceilings and their junctions. It’s important to understand how building sounds are transmitted. The methods used to lesson sound transmission vary. 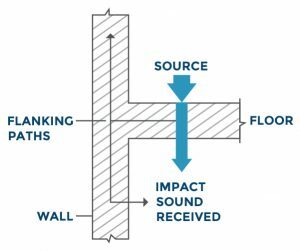 How can engineers minimize sound transmission in designing CFS flooring? According to Hoeller, subfloor mass matters more than anything else in controlling building noise. The heavier the mass separating floors and walls, the better the sound insulation between units. And so, it’s ideal to include as much mass as possible on either side of the joists. Above the joists, two layers of OSB or plywood subfloor provides better sound attenuation than one layer. Below the joists, a double-layered gypsum board ceiling reduces sound transmission better than one sheet of drywall. Joist spacing. Increase the joist spacing as far as structural requirements allow. “Twenty-four inches is better than 16 inches for sound attenuation,” Hoeller Partitioned within the joist cavity, air acts as a sound buffer. The wider the cavity, the greater the buffer, and the greater the decoupling effect. This is especially true if fibrous insulation fills the joist cavity. Resilient channels. Resilient channels are cross-furring members. They attach to a gypsum board ceiling (or wall) and add springiness to a second board layer that isolates sound transmissions. “It’s difficult to achieve good sound insulation with floor and ceiling assemblies without using resilient metal channels,” Hoeller said. Resilient channels are often installed incorrectly. Contractors may use long screws that drill through the entire resilient channel. That creates a rigid connection — coupling the system and facilitating sound transmission, rather than impeding it. An NRC study, “Apparent Sound Insulation in Cold-Formed Steel-Framed Buildings” (RR-337), sponsored by the Canadian Sheet Steel Building Institute (CSSBI), focused largely on flanking sound transmissions. It looked at different configurations for attaching CFS floor joists to CFS-framed walls and how sound travels between spaces by direct paths and by flanking paths. The biggest finding involved subfloors that are continuous across junctions. To prevent flanking sound transmission, engineers should include vibration breaks in both the joists and the subfloor. “Cutting the joists at the junctions is much better for sound insulation than having a continuous joist,” Hoeller said. A variety of CFS profiles, depths, widths, and thicknesses exist in the marketplace. Some profiles have lips, some don’t. Some have proprietary knockout areas. The factor relevant to sound attenuation is web depth, according to Hoeller. “The deeper the joists, generally the better the sound insulation,” Hoeller said. Joist thickness bears little on noise impedance, he said, so you should focus primarily on the joists’ depth and spacing. What about fasteners? Where should you place the screws in a joist? 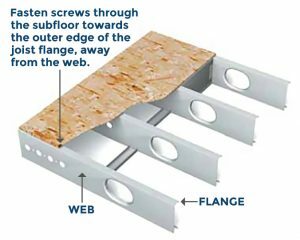 Answer: Screw the subfloor into the joist flange as far from the web as you can. Fastening the subfloor away from the stiff part of the joist allows the flange to act as a decoupling element. It can help attenuate some noise. Finish flooring. Heavy finish flooring adds mass. But a lighter material, such as carpeting, can soften the impact of footsteps and reduce the mechanical power injected into a floor. Sound mats. Resilient floor interlayers reduce impact noise. They can also reduce some airborne sound. With this knowledge, you can meet your goal of engineering CFS floors for peaceful and quiet interiors. Have further questions about sound attenuation in CFS structures? Ask an expert. Contact BuildSteel for complimentary project assistance.